THERE WASN'T MUCH TO CHEER about for Manchester City fans during the mid-1980s. With the club's coffers empty following a disastrous series of signings at the start of the decade, City seemed in decline as attendances dwindled and interest waned. The only relief from the gloom came in the form of a talented crop of youngsters that arrived at the club from 1983 onwards. Fourteen teenagers who would go on to accomplish something supporters had waited 33 years to achieve. Producing one's own players has always been an emblem of pride for football supporters. Established in 1953, the FA Youth Cup has always been the litmus test of a club's youth policy. Until 1986 Manchester City had reached the fi nal twice but actually winning the trophy had proved to be a step too far. 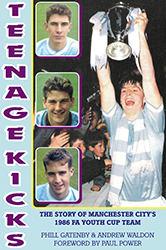 Teenage Kicks is the story of how 'The Class of 1986' won the prestigious trophy for the fi rst time in the club's history and using both exclusive and archive interviews, it describes how the team came together and details what became of each of the fourteen teenagers from that point onwards. PHILL GATENBY has been a season ticket holder at Manchester City since the age of seventeen (1980/81) and has written three books about music ‘Morrissey’s Manchester’ published in 2002 (reprinted in 2009) followed by ‘Panic On The Streets’ in 2007 (reprinted 2012) and ‘The Manchester Musical History Tour’ (2011). This is his fi rst venture into writing a book about football although as a regular contributor to both the Manchester Evening News Postbag and Pink Final Postbag pages, as well as City fanzines ‘Blue Print’ and ‘This Charming Fan’, he has a long track record of writing about his favourites. In September 2011, Phill moved to Boston, Massachusetts - he has two daughters, Rohannah and Leah and two grandchildren, Phoebe and Lucas. ANDREW WALDON is a veteran Manchester City supporter, who has seen his favourite club play at over 180 different grounds. A regular contributor to the official Manchester City programme and Official City Handbook he has also contributed to fanzines ‘King of the Kippax’ and ‘City Til I Cry’. Following retirement from his 'day job', Andrew has written several books on the club, most recently ‘My Eyes Have Seen The Glory’ and ‘Manchester City in Europe’ with more publications for release before the end of the year. Andrew also runs a website about the Reserve and Academy sides of City - www.mcfcreservesandacademy.co.uk.